Brian P. Flanagan is associate professor of theology at Marymount University in Arlington, Virginia. He is the co-editor of Liturgy + Power, the 2016 annual volume of the College Theology Society, and the author of Communion, Diversity, and Salvation: The Contribution of Jean-Marie Tillard to Systematic Ecclesiology. He has also written articles on ecclesiology, ecumenism, and liturgical theology. "Through a highly readable and engaging account of the many failings of the church in its historic and recent dark nights, Flanagan's central argument is an overwhelmingly positive and hope-filled one: that in acknowledging the church's own sinfulness we also come to realize that it, and we, within it, are always engaged in a pilgrim journey along the way toward holiness. This important addition to the growing literature on ecclesial sin and repentance will challenge, provoke, and inspire in equal measure." "Brian Flanagan's new book takes up the extraordinarily challenging but absolutely essential question, 'What does it mean for the church to be both holy and sinful?' Most Christians would readily admit this as their lived experience, but might have a harder time articulating this reality theologically. Stumbling in Holiness shows us, in a clear and inviting way, how the framework and language to understand this reality can be found within our theological traditions, and how the holy and sinful church is nothing new, but reaches as far back as the time of Peter and Paul." "With a graceful style and a gritty realism, Brian Flanagan wrestles with one of the most deeply felt theological issues over the last century. How can the Christian church pray, think, and act in such a way that honestly acknowledges and confesses the tragic consequences of our collective sinfulness, while clinging onto the healing power of God's grace among us as a source of courage and hope. Flanagan's special flair is his subtle analysis of crucial intergenerational theological disputes in a way that invites a wider audience to perceive what is at stake in a doctrine under development and a community stumbling in holiness." "There are plenty of books on holiness and more than a few on sin. Brian Flanagan has achieved the rare distinction of balancing a conversation about the relationship between sin and holiness that plays down neither. 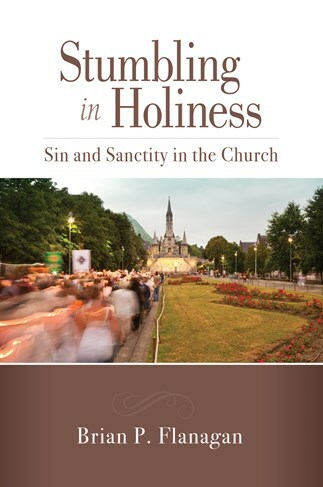 Recognizing the essential connections between sin and holiness in the life of any believing Christian, he tackles the much thornier question of how the two play roles in the Church itself. And he succeeds delightfully. We all may stumble in holiness, but his treatment of the topic is as sure-footed as could be." "With a foundational premise that `the church is a historical people and not an abstraction . . . in which sin and sanctity coexist,' Flanagan explores the tension of the church's holiness and sinfulness. With care and clarity, he unpicks the threads of this tension and leads the reader to a deeper appreciation of the mystery of the church. A solid contribution to an important debate as the historical community of the Catholic Church publicly struggles with its own failings." "Sinfulness in the Church is a topic that by its very nature makes some believers and leaders quake. Yet Brian Flanagan skillfully demonstrates how sin and sanctity, mistake and forgiveness are all fundamental elements of the spiritual and incarnated journey in faith for individual and institution. Both believer and community of believers can only slouch toward Bethlehem waiting to be reborn. Flanagan's particular contribution is to cut through the false dichotomy—a firewall for fallibility—that the church's sons and daughters can stumble without the church's own sanctity being compromised. "This book should be read and taught by ecclesiologists, parish ministers, church historians, and liturgists." "Flanagan's treatments of structural evil in both chapter 2 and chapter 4 are exceptionally well done and open up new avenues for reflection on how the Church can be sinful in very concrete ways, without losing its holiness as a constitutive mark of being the true Church. I recommend this book to all theologians and any adult who wishes to sort through the paradox in the words of Lumen gentium #8." "One of the best books on ecclesiology I have read in years!" "Of the many valuable contributions this volume makes to theology broadly, and contemporary ecclesiology specifically, perhaps the most important are Flanagan's guidelines for speaking about a holy and sinful church. Flanagan invites scandal-plagued Catholics to face the reality of our sin with renewed hope with helpful rules. It is difficult to imagine a better gift for the New Year." "Recommended for readers having some college-level theological training."